You think history is boring? 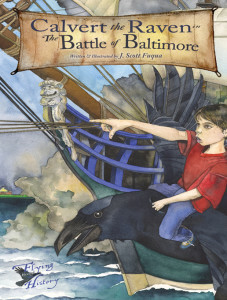 Baltimore kid Daniel does–until a chance encounter with a magical talking raven named Calvert sends him flying back to 1814, where he finds his home city under siege by a British army on the verge of defeating the United States of America in the War of 1812. Amidst the fire of muskets, the thunder of cannons, and the dark approach of the British armada, Daniel discovers just what it took for a young nation to endure the Battle of Baltimore. He witnesses firsthand the bombardment of Fort McHenry. “History,”; Calvert tells Daniel, “is watery.” And maybe the star-spangled banner won’t survive this time. The beautifully illustrated pages of Calvert the Raven in the Battle of Baltimore, the first book of the Flying Through History series, are as close as you can get to the Battle of Baltimore without going back in time yourself. Author and illustrator J. Scott Fuqua takes you on a harrowing journey through a history of near misses, narrow escapes, and brave soldiers with no idea what tomorrow would bring. When you’re flying through history, history is never boring.